It is believed that during the reign of Shah Jahan, India had the largest GDP or Gross Domestic Produce among all the countries of the world, including the English who had only recently started their journey to colonise the world. In fact the production in India at the time was a staggering 25% of the world produce (source). The per-capita income in India was same as some of the most advanced world economies of the time, including Britain and France. It was during this era of prosperity in India that Shah Jahan also took up the construction of some of the most monumental buildings the world ever made, including the majestic Taj Mahal. Roughly during the same time Europe was also growing rapidly and some of the most well known buildings were built, including St Peter's square at Vatican and Palace of Versailles in France, both in the then dominant baroque style. Back home in India with the seat of power in Delhi now, in 1644 Shah Jahan decided of build a huge place of worship for Muslims, right across the street from his official residence - the Red Fort. 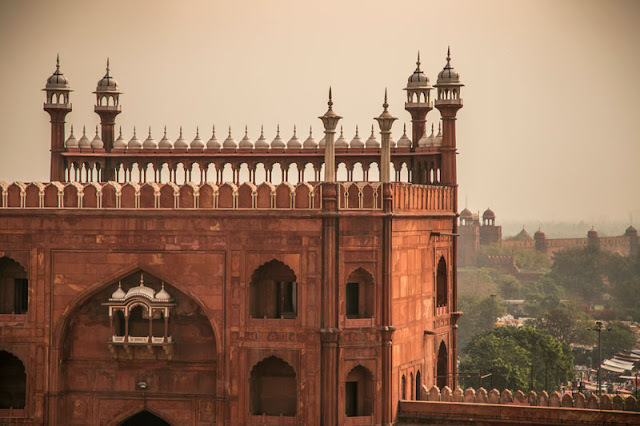 The choice of material was red sandstone, the use of which was already perfect by the Mughals and came to define their architecture style. 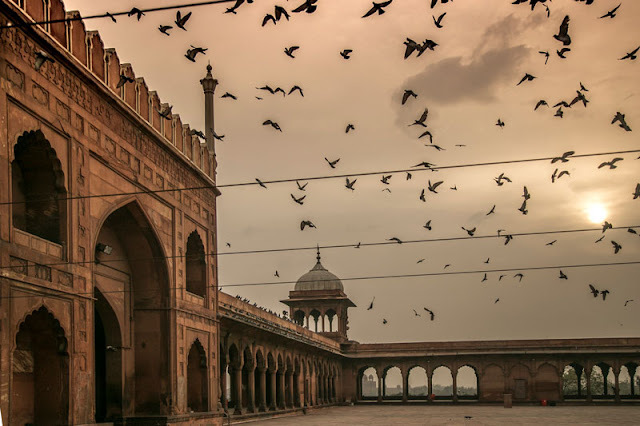 The main architect of the mosque was Ustad Khalil who created a template of such a perfect mosque that the same design was later used to build the Badshahi mosque in Lahore later by his son Aurangzeb. Finally after 12 years of hard work by over 5000 workers, the mosque was finally ready in 1656. It was not other mosque, so for it's inauguration, a special imam was invited all the way from Bukhara, in present day Uzbekistan. Even today the imam of the mosque is from the same family, and they are known as Bukharis. The mosque is built at an elevation of 30 feet from the ground, on a red sandstone porch. There are two minarets on either side of the main mosque and both are 40 metres (130 feet) high. One of these is also accessible to the visitors to climb up. The courtyard is large and was the biggest at that time. When full, it can accommodate a total of 25,000 worshippers. As is typical to most mosques, the prayer hall is simple and bereft of any excessive designs. The floor has design which replicates the prayer matt used by Muslims. Soon after the mosque was finished, Shah Jahan took ill and in 1658 was replaced by his son, Aurangzeb, as the Emperor of India. After eight years of confinement at the Red Fort in Agra, he finally died in 1666, aged 74. With Shan Jahan death, and the changed priorities of subsequent Mughal kings that ruled the country India's legacy of a leader of arts, crafts and architecture, slowly faded away. Looking back now, this mosque was the swansong of Shah Jahan's illustrious region at the helm of the Mughal empire and came to signify the beginning of an end of India's golden era. Check out this video from my time at the mosque. The video is completely shot and edited on iPhone 7 Plus. 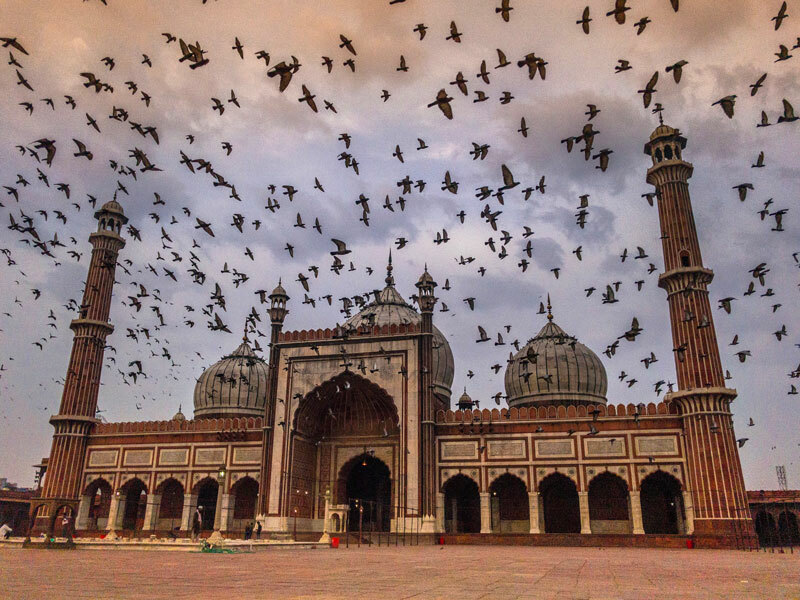 The time to visit Jama Masjid is early morning or late afternoon. You can spend as little as 30 minutes to a few hours. I usually spend a couple of hours at least. The entry is free for all, though you will have to buy a ticket for a camera (Rs 300, which is rather steep compared to other Indian heritage sties). The closest metro station is Chandni Chowk and from there you can either walk or take a rickshaw. Of the four minarets, you can go up on one of them and the fee for the same is Rs 50. The minaret is accessible only from 9 am till sunset. There are 121 steps and these are very steep. The caretaker might ask you to take off the backpack before you climb up as the way up is also very narrow. People of all faiths are welcome, but during the prayers (5 times a day), only Muslims are allowed. Shorts are not allowed, but they usually have a sarong available at the main gate which you can borrow for a small fee. There are three access gates, and all are open and accessible. The most popular gate is the Eastern gate, which was used by the kings also, back in the days. There is a paid toilet (Rs 5) on the left before you take the steps up. It's a bit tricky to use as most men traditionally squat down and pee. I tried and failed, and then stood up and peed. Everyone stared, but didn't say anything. It was an odd experience, but it was also a necessity. Beautiful architecture and beautiful pictures. Five star for both. Shows so much purity and positive vibes. Wonderful frames of a magnificent structure. Beautiful article with beautiful photographs and video. 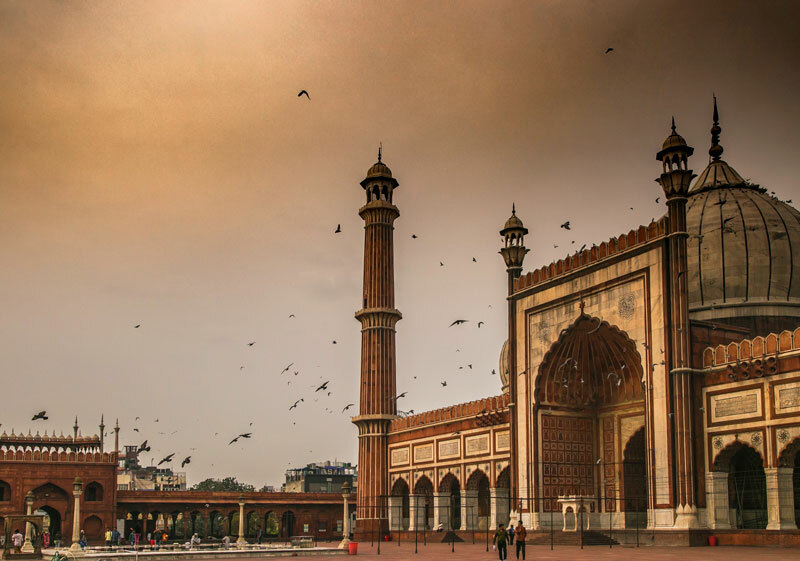 I remember climbing on that Minaret and getting a birds' eye view of Delhi. 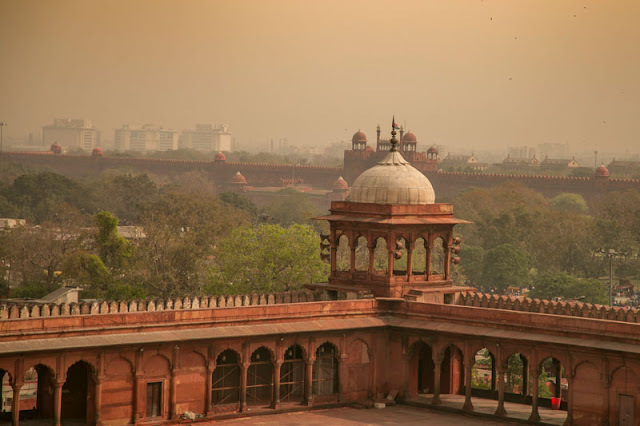 The view of Red Fort is amazing from there. Mosque looks cleaner in your images than what I remember of it. Is it your photography or the Clean India is working? India's rich history is quite remarkable. I love all your pictures of Jama Masjid and the video's quality is really great. So sad to read that after Shan Jahan's death, other rulers could not live up to expectation. It was nice to read another fascinating history India. I visited this place in 2011, when I was in New Delhi. I loved the video you created. Also, the music is great. It is nice to see the face behind this blog. 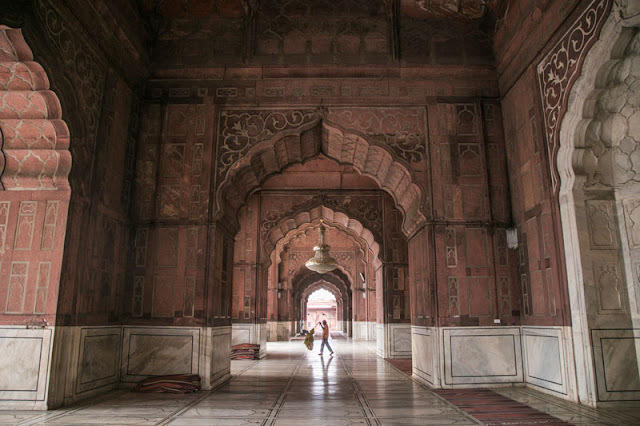 I wasn't aware of the architectural similarities between Jama Masjid and the Badshahi mosque. Thanks for pointing that out, Sid! The red sandstone really makes Jama Masjid look majestic and pretty without being too tacky. Great shots! 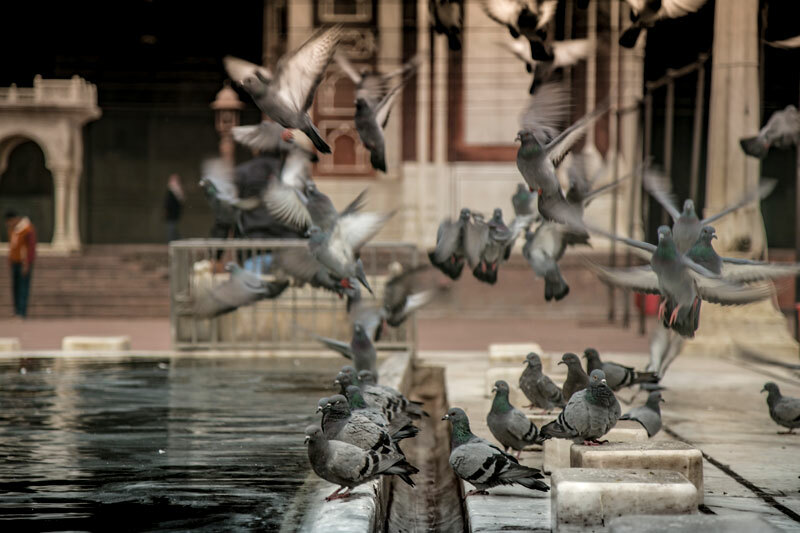 You got stunning shots of Jama Masjid with pigeons flying throughout the shot. Makes it look very dramatic and romantic! 12 years by over 5000 workers is no easy fete! They of course did a spectacular job, and it’s a testament to that time period that their structures still stand and are still visited and adored by locals and tourists today. The Mughal rulers have given India some of the best architectural wonders and of course the contribution of Shah Jahan stands out in marblesque splendour in the form of the Taj. But apparently there is much more to his contribution and one of the gems is the Jama Mazjid. It is indeed a sublime prayer in stone and a lasting testimony to Shah Jahan's refined and classic taste. Thank you for sharing all those pictures and guides for wonderful architectures. I have visited Jama Masjid two times in last quarter and it is really peaceful. Incredibly beautiful photographs and fantastic narration too. Read this for the second time and loved every bit of it. 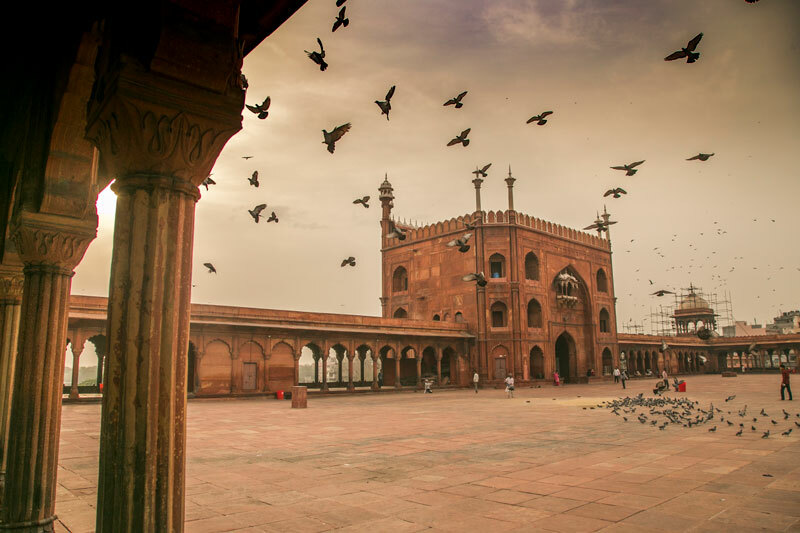 The architecture of Jama Masjid is very large and solid. very beautiful architecture.